Those traveling within the Gallente Federation from the Peccanouette Circle to the Patrie Perimeter can make a shortcut midway through by traversing Ouperia - a cold and uninhabited white dwarf system. Few now remember the name Ouperia - most people only know it by what it is commonly called, Old Man Star. Interstellar jump drive technology is fairly new. Until it came along, the only way for the empires to expand their territory was to send a ship to a solar system to build a stargate. The fastest versions of these construction ships managed a speed of ca. 30% of the speed of light. At this speed a system 10 light-years away could be reached in 33 years, or there about. The crew of the construction ships was put into cryogenic stasis for the duration of the trip, only to be revived once the destination was neared. Later, after jump drive technology became available, several of these ships were retrofitted with jump drives. This meant that decades-long trips were a thing of the past. However, none of these older models had been built to handle the sort of technology found in these jump drives, and this meant that stories of fateful malfunctions circulated frequently. One such story was that of Old Man Darieux’s construction ship. In YC 11, when the Gallente-Caldari War was near its end, a Gallentean construction ship set out for the desolate system then known as Ouperia. There was little monetary gain to be had from the system’s middling asteroid fields, but a stargate there would serve as a link between the Peccanouette Circle and the Patrie Perimeter, which made it a good long-term trade prospect. The construction ship departed from Villore system, some 12 light years distant. Estimated travel time was only a few minutes. The crew consisted of five people, a huge reduction from the old days when dozens of crewmen were needed – with the technological advances made over the course of the war, swarms of drones and robots were by that point responsible for most of the actual construction, with the crew acting mostly as operators and technicians. Shortly after the construction ship set out, disaster befell it. A miscalculation in the drive made the jump misfire, sending the ship several light years off course and planting it in the middle of an asteroid belt. Seconds later, a large asteroid hit the ship full force. The impact killed four of the ship’s crew, but the fifth survived. His name was Ceul Darieux and he was the ship’s drone operator. Back home the authorities, still embroiled in the war, were facing great internal debate as they pondered CONCORD-mediated peace talks with the Caldari. Finding little incentive to lose another multi-million ISK ship on a system with no greater short-term value than Ouperia, they opted to shelve the project. Since the vessel’s calculation error was evident to the station personnel who’d sent it off, and because its subspace beacon and comms arrays had been damaged in the impact, the ship was believed destroyed and written off. Darieux’s immediate problem was how to feed himself – to save space and weight no food was carried on the ship, but the greenhouse bulbs from the ship’s earlier incarnation were still equipped to grow edible plants. This, however, required the proximity of a sun to provide the essential light and heat - in short, the greenhouse bulbs and the plant seeds were useless in deep space. Water was an equally pressing problem, as was the shortage of oxygen. The state of the ship did not make things any easier - the asteroid had ripped a huge gash into the side of the ship and destroyed many of the ship’s vital systems. The cargo hold was hit especially hard - debris of destroyed equipment and pieces of the asteroid cluttered the small space. Darieux put his engineering skills to good use to solve these problems. He began by tampering with the fuel tanks. The fuel tanks, filled with liquid hydrogen and liquid oxygen, served the propulsion system once the ship had to be slowed down once near the destination system. Fiddling with the fuel tanks was extremely dangerous, as the ingredients were highly flammable, but with patience and caution Darieux managed to get a controlled reaction out of the fuel, which gave him both water and oxygen. Then he welded together every piece of glass and metal plate he could muster in the ship to gather and store what little light he could from distant stars. This was sufficient for him to start food production in one greenhouse bulb - by linking the bulb into the ship’s septic tank fertilizers for the plants were secured. The result was enough food for one man and later enough oxygen production as well. In other words, Darieux managed to create his own little ecological system. Once Darieux had stabilized the conditions on the ship and provided for himself he next had to adjust the course of the ship. The impact had slightly altered the ship’s course and in the vastness of space it meant the ship would bypass the Ouperia system by billions of kilometers. The propulsion system had been damaged beyond repair - the ship was out of control and heading into deep space for eternity. The more time spent on a solution the further adrift the ship would be, so a quick resolution was required. Instead of spending valuable time trying to build a new propulsion system Darieux opted for a more ingenious solution: The ship was equipped with a token force of combat missiles. Darieux fired the missiles and turned them around to explode against the strongest points of the ship’s armor. By carefully calculating the impact points and controlling the size of the explosion Darieux managed to correctly align the ship to its original course. Darieux briefly contemplated trying to turn the ship completely around, but quickly realized that he neither had enough missiles for this, nor would the hull withstand such a brute way of turning around even if he had them. Now the dullest part of the journey began, as the ship was still decades from Ouperia system at its current speed. Darieux spent the time creating fantastic robots and designs using the scrap heap in the cargo hold. He discovered that the asteroid that hit the ship had been very rich with the super rare mineral megacyte - which has unique qualities that make it extremely valuable in advanced robotics and drone manufacturing. Having to live and work in zero gravity year in, year out gave Darieux a distinctive insight into hi-tech assembly and despite the limited resources and tools at his disposal, what he created during those long long years has never since been surpassed in originality or brilliance. At long last the ship entered the Ouperia system, 44 years behind schedule due to the decreased speed caused by the impact and subsequent missile explosions. Over the years Darieux had invented several techniques for slowing the ship down, just for this occasion. His main method was to use the stellar bodies in the system to help him slow down. Even if the propulsion system itself was still out of order Darieux managed to get some of the directional thrusters to work, feeding them with the last drops of fuel. Now he began to zigzag between the system’s planets, using the gravity to his advantage to stop the ship and even going so far as to enter the atmosphere at one point (protecting the ship with a handcrafted shield). Through these unorthodox methods Darieux managed to stop the ship from shooting out into deep space again. By this time Darieux was an old man, his gaunt body in a bad state due to too much time in zero gravity. Yet his spirit was still strong and he was unwilling to give up now that he’d managed to reach his destination. Satisfying though it was to be in the Ouperia system his situation was still dire as the prospects for any kind of rescue were absolutely none at all. His fate lay entirely in his own hands and the only option was to try to construct the stargate all by himself. All the equipment needed to construct the stargate was long since destroyed or altered beyond recognition. Darieux was forced to start from scratch devising and building innovative drones and robot factories. He centered his activity around a large asteroid that was conveniently close to the resonance point between the white main star and its tiny brown companion. There, on that asteroid, Darieux constructed a small assembly factory as well as his home and for five years he labored along with his robot friends to complete, single-handedly, a stargate. A feat that maybe a handful in the whole universe could pull off, Darieux performed at the age of 80 – white-haired, wrinkled face, shaky hands and all. Imagine the surprise of the stargate controllers in the Villore system when a patched up construction ship limped through their stargate - the triumphant remains of a mission long since considered dead and lost. Darieux reveled in the media limelight for a while before launching his own company, CreoDron, centered on the blueprints created in an incredible voyage lasting almost half a century. He died a few years later, his frail body and failing internal organs too badly damaged for cloning. 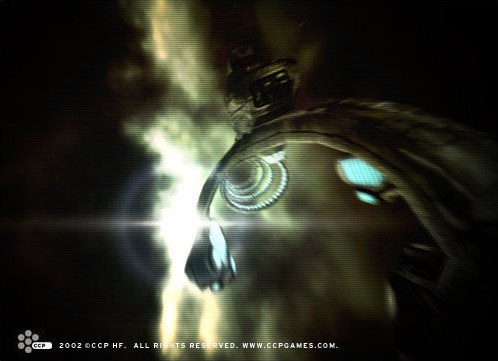 But his legacy remains strong to this day - CreoDron is the biggest drone manufacturing company in the universe of New Eden and the innovations of its founder still drive the drone industry. Renaming the Ouperia system the Old Man Star is the least an appreciative world can do.